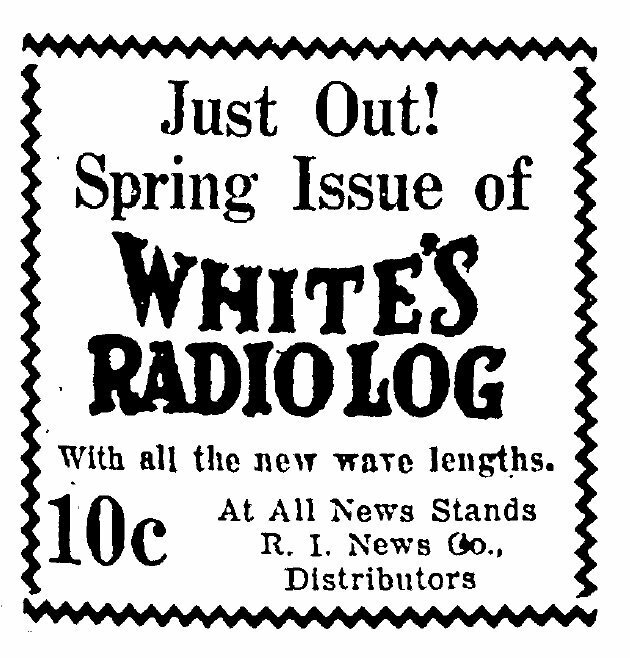 Whites radio log was a small publication out of Rhode Island in the 1920s that eventually spanned the whole country. They were located at 1311 Smith St, Providence, RI. 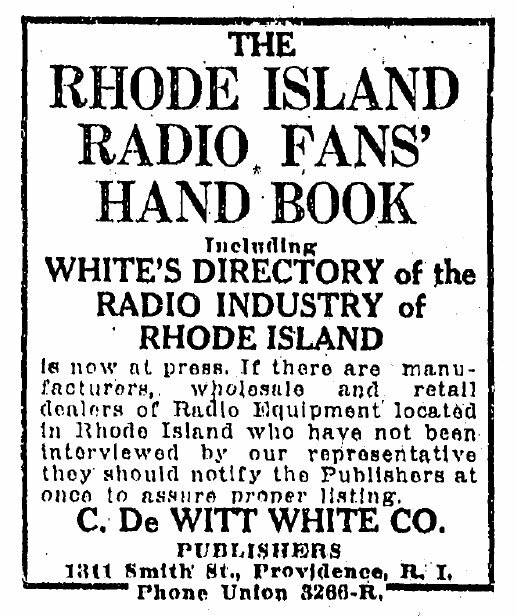 White's Radio Log was founded in Providence, R. I. by Charles De Witt White as an extension of his earlier publishing activities. 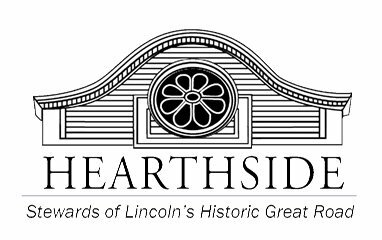 Interestingly enough, these, in turn, were a continuation of the business established by his father: the publication of city directories, street guides, and municipal tax guides. In the early days of broadcasting, compiling a list of operating stations and their frequencies was no simple task. Reason was that prior to the Dill-White Radio Act of 1927, any feed merchant, auto dealer, barber, or undertaker who wanted to advertise his wares or services had only to select a frequency and go on the air. A great many experimenters and businessmen did just that. Nevertheless, Mr. White's directory publishing experience had convinced him that he could successfully assemble a radio log. 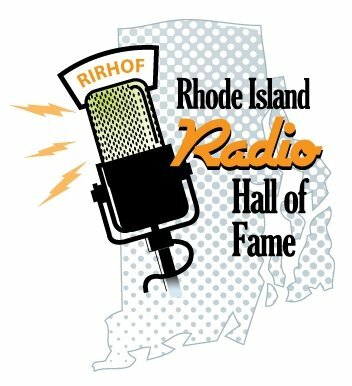 In 1924 he justified this conviction with "The Rhode Island Radio Fan Handbook", following this shortly after with White's Triple List of Radio Broadcasting Stations. In 1927 the two publications were merged and nation-wide distribution established. In ensuing years related publications, such as Sponsored Radio Programs, Radio Announcer's Guide, Short-Wave Schedule Guide, and a special Canadian edition of the Log (which had had its title shortened to the one it bears today), were also issued. The Log itself eventually reached a combined circulation of well over a million copies. It also came up with some rather unusual bedfellows. 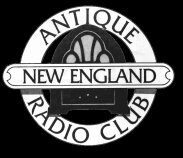 In 1929-31 it was distributed as the Enna Jeitick Radio Log (to promote the sale of shoes); in 1938-9 as the General Electric Radio Log to promote General Electric's "sensational 1939 receivers with pushbutton tuning." The Fall-Winter number of the 1927 Log listed 701 U.S. stations. Most powerful were WEAF (now WRCA), New York, with 50,000 watts; KDKA, Pittsburgh; WGY, Schenectady; and WJZ (now WABC), New York. each with 30,000 watts; WGN-WLIB, Chicago, with 15,000 watts; and Boston's WBZ, also with 15,000. 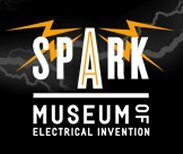 Five stations listed (one a Junior High School in Norfolk, Va.) operated on a mighty 5 watts; more than 100 stations had outputs of less than 100 watts. The current Log cross-indexes over 4244 U.S. standard-broadcast (AM) stations, over 2247 U.S. frequency-modulation (FM) and over 810 television stations, has a complete compilation of Canadian broadcasters, and, in addition, has a comprehensive world-wide roster of shortwave stations. With the success of his Log, Charles De Witt White (a direct descendant of Pere-grine White, the first child born on the May¬flower's historic crossing and bearer of the name of another illustrious ancestor, De Witt Clinton) disposed of his city directory and street guide interests. In time, he trans¬ferred his editorial operations to Bronxville, N. Y., a suburb of New York City, where he could remain in close touch with the broadcasting industry. On April 6, 1957, having only recently completed revising and updating material for the 34th consecutive year of his Log, Mr. White died in his sleep. He was 76 years old. Charles De Witt White's daughter and heir, Mrs. W. R. Washburn, sold all rights in and to the Log to Science & Mechanics Publishing Co., and entrusted us with continuing her father's work. This we were proud to do back in 1958 in the fifth issue of RADIO-TV EXPERIMENTER—then an annual publication. 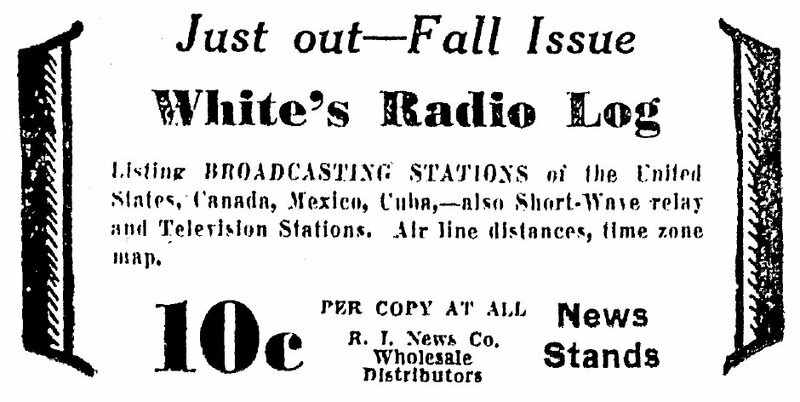 Beginning with our first bimonthly issue in 1964, White's Radio Log was divided into three parts (it had grown to 60 pages in size and was much too large to incorporate in any one issue). From 1964 until the present, we published the Log in three parts, updating each part right up to press time. Now, in 1969, the size of the Log again necessitates a change. 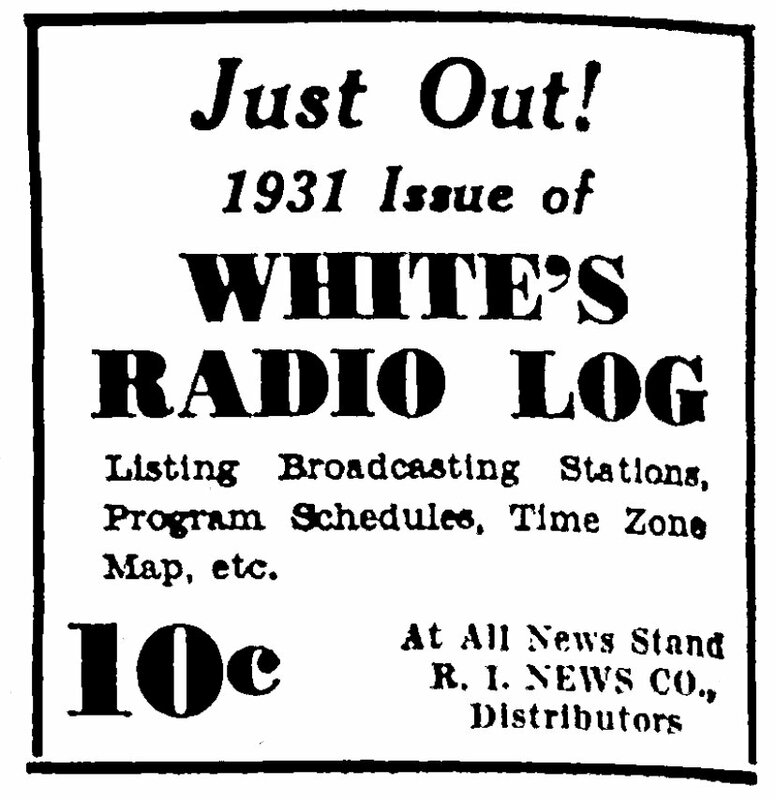 Therefore, White's Radio Log will be published in six parts during 1969. 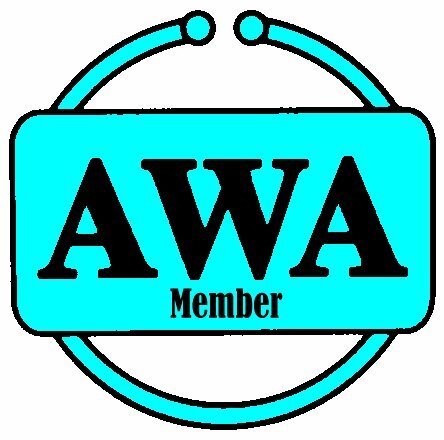 In each issue we will include a major listing for either AM Broadcasting Stations, FM Broadcasting Stations or Tele¬vision Stations; plus the expanded World-Wide Shortwave Section (brand new for each issue); plus the all-new Emergency Radio Listing for major U.S. cities (a different major city will appear in every issue). In this issue of RADIO-TV EXPERIMENTER, White's Radio Log contains U.S. AM Stations by Frequency, World-Wide Shortwave Stations, and Emergency Radio Listings for Chicago, Ill. and Surrounding Communities. As always, as we go to press on each issue of White's Radio Log, station additions, changes, and deletions are made by the U.S. and Canadian governments. The same holds true for the world-wide shortwave broad¬casters. Therefore, the Editor cordially invites all readers to inform him of any changes that must be made to keep the Log up to date. (In some instances our readers discover and notify us of changes before the FCC or DOT officially inform us.) Keep your cards and letters corning—they are most sincerely appreciated, and it's the one way you can help us make a better Log.